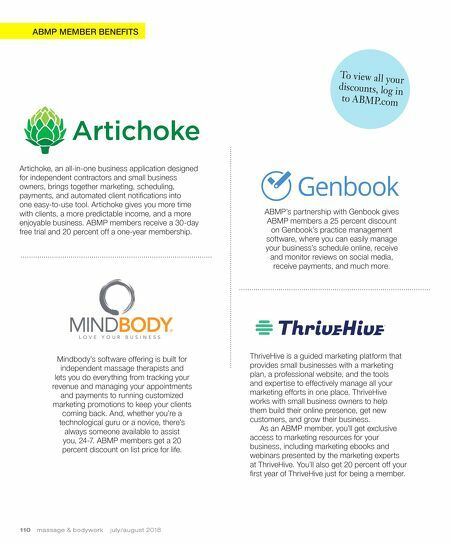 ABMP MEMBER BENEFITS To view all your discounts, log in to ABMP.com Artichoke, an all-in-one business application designed for independent contractors and small business owners, brings together marketing, scheduling, payments, and automated client notifications into one easy-to-use tool. Artichoke gives you more time with clients, a more predictable income, and a more enjoyable business. ABMP members receive a 30-day free trial and 20 percent off a one-year membership. 110 m a s s a g e & b o d y w o r k j u l y / a u g u s t 2 0 1 8 ThriveHive is a guided marketing platform that provides small businesses with a marketing plan, a professional website, and the tools and expertise to effectively manage all your marketing efforts in one place. ThriveHive works with small business owners to help them build their online presence, get new customers, and grow their business. As an ABMP member, you'll get exclusive access to marketing resources for your business, including marketing ebooks and webinars presented by the marketing experts at ThriveHive. You'll also get 20 percent off your first year of ThriveHive just for being a member. Mindbody's software offering is built for independent massage therapists and lets you do everything from tracking your revenue and managing your appointments and payments to running customized marketing promotions to keep your clients coming back. And, whether you're a technological guru or a novice, there's always someone available to assist you, 24-7. 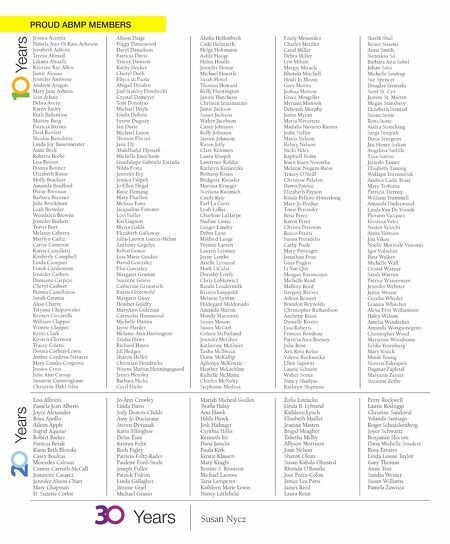 ABMP members get a 20 percent discount on list price for life. ABMP's partnership with Genbook gives ABMP members a 25 percent discount on Genbook's practice management software, where you can easily manage your business's schedule online, receive and monitor reviews on social media, receive payments, and much more.